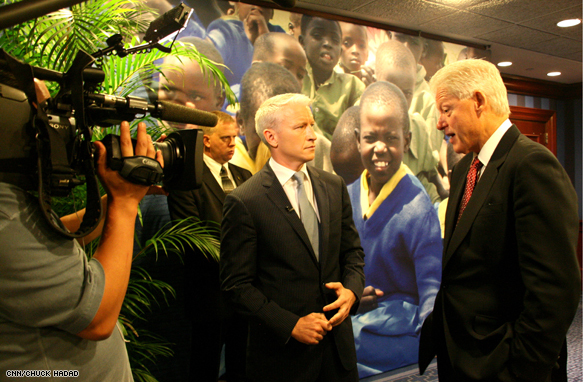 Program Note: Tune in tonight for Anderson's interview with Bill Clinton on AC360° at 10 p.m. ET. Former President Clinton took a break from his annual Clinton Global Initiative meeting in New York City to sit down with Anderson Cooper. Watch the interview tonight on AC360° at 10 p.m. ET. This has to be a dream interview. I have watched numerous interviews of Bill Clinton and he interviews well – imparting information on what he is doing and what he hopes it will achieve. And of course what he thinks of the current political situation although now he has to be careful of what he says about his wife's boss. I loved the photos – thanks for posting them – hope the interview is as good as the pictures look!! Is President Clinton autographing a picture for Anderson? That's very nice. I think it should be the other way around. Should be interesting to see what views President Clinton has on all the goings on. Lets hope there's a silver lining. Nice pictures,lookes like both men have the same haircolors. It looks like a good time had by all. President Clinton is a fasinating person. That I admire alot. I hope you got that autograph. can't wait to see the interview. Looks like this interview will be enjoyable to watch. 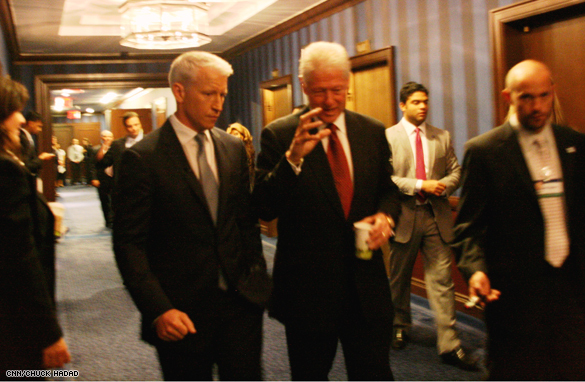 It's clear from the pictures that Clinton eventually put Anderson at ease. AC looks tense and nervous at first–he fiddles with his fingers and and balls them up in two pictures, and he's finally smiling in the third photo. He's a great interviewer, but needs to be more confident around the big leaders. But I think his nervousness in itself is endearing, and I look forward to seeing the chat. I have President Clinton's book...wish i could get it autographed. It's a great book!! Cool pics!! Can't wait to see the interview tonight. Hope Cooper asked some really intense questions and got some straight answers. That's hard to do sometimes with these politicians!